Last weekend Erika and I ran the Hot Chocolate 5K here in Nashville. Although it’s billed as “America’s Sweetest Race” (thanks to the post-race hot chocolate and chocolate fondue), my main motivation for signing up was the even sweeter running top. 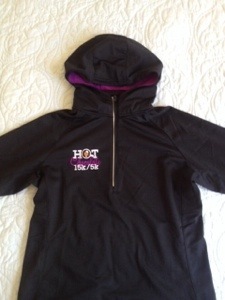 Not just a technical running shirt, this beauty is a cute hooded winter running top with a hood and thumb holes. Two of my favorite things in a winter running top are a hood and thumb holes (convenient if you get chilly but you don’t want to deal with pulling hats and gloves on and off). If I sound obsessive, after the race we met a woman who told us she traveled from Champaign, IL for this top. She traveled from out of state to run a 5K in NASHVILLE in FEBRUARY for the SHIRT. I don’t sound so crazy now, huh? Hot Chocolate 5K/15K races are held in cities across the country by a company called RAM Racing, whose national charitable partner is Ronald McDonald House Charities. The mission of Ronald McDonald House Charities of Nashville is to provide resources and “a home away from home” for families of critically ill children receiving care at Nashville area hospitals. Although they are not Ronald McDonald house beneficiaries (because they’re adults), many of our transplant friends from other states are required to stay in Nashville before, during and after transplant, so Richard and I are aware of the challenges they face. It isn’t easy for these families to leave their homes and support networks behind. Doing it with children has to make it even more challenging. So, in addition to the chocolate and the sweet running top, the fact that this race benefits a great cause gives you one more excellent reason to sign up. I wasn’t familiar RAM Racing before running the Hot Chocolate 5K, but I came away impressed. One of my pet peeves is when an event over-promises and under-delivers, leaving the runner feeling ripped off. This is definitely NOT one of those events. Everything from the packet pickup, to the swag, to the event itself, was first-rate. I swung by the packet pickup on Thursday and was won over immediately by the free chocolates handed out at the door by a smiling volunteer. In fact, it seemed like there was an army of pleasant, helpful volunteers on hand. I asked the young woman who handed me my race bag what inspired her to volunteer and she said it was the great volunteer shirts. Whoever handles the shirt design at RAM Racing obviously deserves a bonus. At the packet pickup, there were many thoughtful touches, including an area where you could try sample shirts on for size and exchange them, if needed. The shirts themselves were even nicer than I’d hoped, with a soft fleecy lining. In a running store, they would retail for much more than the entry fee. There was also a taste of the tempting chocolate fondue featured after the race. The morning of the race was downright frigid for Nashville. When I rolled out of bed at 5:30 am, The Weather Channel was reporting a temperature of 23 degrees, with a “feels like” temperature of 11 degrees. Brrrrrr! Erika and I both found on-street parking and quickly met up to walk to the start at Bicentennial Mall. The start area was well-marked with plentiful port-a-potties (very much appreciated – who wants to stand around in the cold waiting to go to the bathroom?). We headed to our corral to wait for the start. After listening to The Star-Spangled Banner and some pre-race announcements, the Corral A runners took off. A few minutes later, we crossed the start line. The course wound through Germantown and Bicentennial Mall and wasn’t too tough, except for the hill by the State Capitol in the last mile. The good thing about the hill was that after the turnaround at the top, it was a downhill finish. After we finished, we quickly headed for the chocolate tent where each finisher was handed a dish of chocolate goodies. 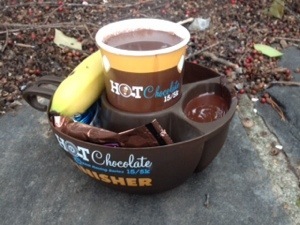 A cup of hot chocolate fit in the center of the dish, surrounded by compartments for chocolate fondue and a variety of dippers including bananas, rice crispy treats, marshmallows, and pretzel bites. I’m not sure if it was the cold weather, but it was some of the best hot chocolate I’ve ever tasted and it stayed hot until the last drop. If the weather had been warmer, I would have polished off all of the generous serving of delicious chocolate fondue. Sadly, getting my mittens back on took priority so I left some bits of uneaten chocolate fondue behind. On the way back to our cars, we both agreed we will definitely run this race again. The race results were quickly posted online. Although it was far from a PR for both of us, we were pleased with our results. I finished 28th out of 178 women in my age group – I’ll take it. The thing I was most impressed by was the thousands of participants who came out to run or walk in this event on a VERY cold morning. I think it proves that if you put together a quality event and promote it well, people will show up. The Hot Chocolate 5k/15k is a well-organized event with great value. I received an email notifying me that 2015 registration is now open, so it looks like it will be an annual event. It’ll be warmer next year, right? This entry was tagged hot chocolate 5k. Bookmark the permalink.